It was Tostada Tuesday. 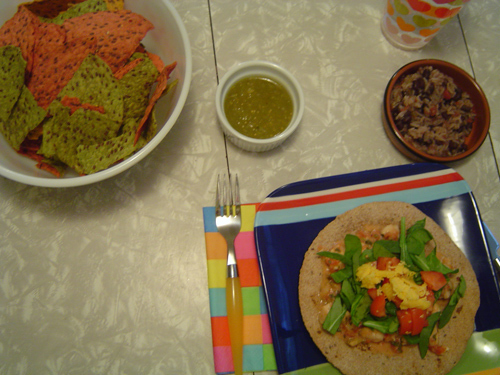 Solely because I made tostadas and it was totally Tuesday. One good thing about this recipe, besides the fact that it’s easy and delicious, is that it can easily be adjusted to serve a big group of people or just two. If you are a vegetarian feel free to use black beans instead of the chicken. You won’t even believe it, but this was adapted from a Weight Watchers recipe. 2. Combine chicken and lime juice into a zip lock bag and marinate in fridge for 30 minutes or so. 3. Place torillas on baking sheet and bake at 350 degrees for 4 minutes or until lightly browned and crisp. Set aside. 4. Take chicken from bag, toss lime juice out.Sprinkle chicken with salt and pepper and put in a sprayed skillet and cook over mediun heat til done.. 4 minutes or so..add salsa and sour cream. Heat through.. but do not boil. 5. 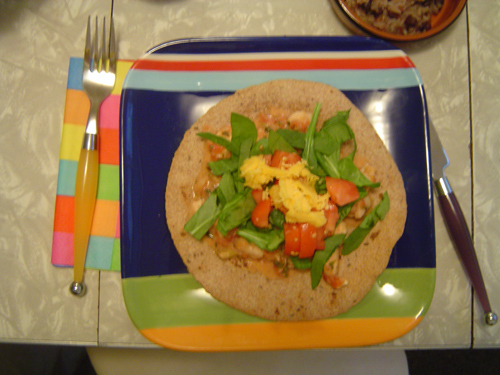 Divide chicken mixture evenly among tortillas, top with spinach, tomatoes and cheese.